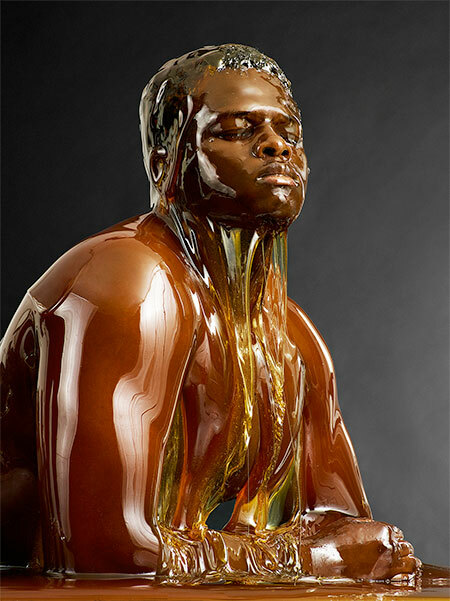 Unique photo series by American photographer Blake Little features people covered from head to toe with delicious honey. Buckets filled with golden honey poured onto the heads of fashion models. What an absolute waste of honey. So sad! Also, these images could of have been way better staged. If your seriously going to put honey to waste, why not do it in absolute style and perfection? I can think of thousands of better uses for honey than this. terrible waste of food ! and there are still people starving on this planet ! Do not like it. Waste of honey. I wonder what statement the artist was trying to portray by this?I feel bad for the bees. What a huge waste of HONEY!!!!!!!! !